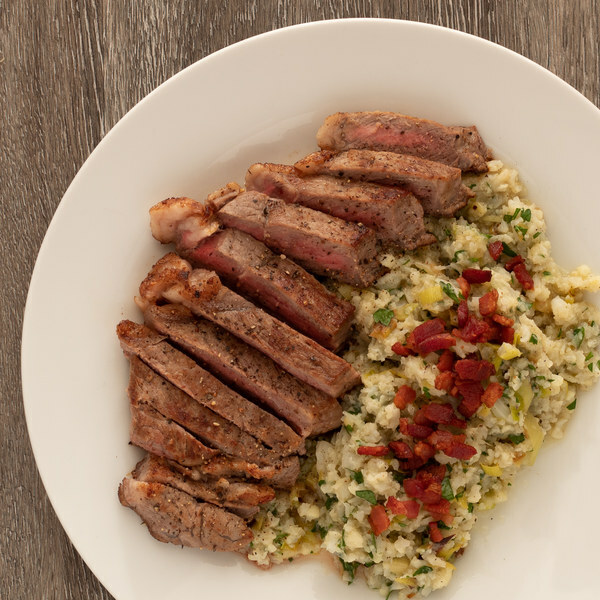 ← Pan-Fried Striploin Steak with Cauliflower & Leek Mash. Wash cauliflower and cut off the leaves. Separate into small florets and cut the thick stems into smaller pieces. Transfer to medium saucepan. Add broth to the saucepan, cover, and bring to a boil. Reduce to a simmer and cook until cauliflower is tender and easy to mash, about 12 minutes. Drain any excess liquid. Meanwhile, preheat a skillet over medium-high heat. Chop the bacon into small pieces. Add to the skillet and cook until crispy, 4-6 minutes. Once cooked, remove bacon bits from skillet with slotted spoon and drain on paper towel, leaving the drippings in the pan. Trim off the root ends and the dark green top of the leek, leaving only the white and pale green parts. Cut the leek in half lengthwise and rinse under running water, separating the layers to remove any dirt and grit. Slice on the diagonal into ¼ inch thick pieces. Slice on the diagonal into ¼ inch thick pieces. Once the bacon has been transferred, add the leeks to the skillet and season with salt and pepper. Cook, stirring occasionally, until tender, about 5 minutes. Once the cauliflower is ready, mash with a fork or potato masher, adding the leeks, butter, and parsley to the saucepan. To serve, divide the cauliflower mash and steak between plates. Top the cauliflower with bacon bits. Enjoy!